Robbie Buhl is a former Indy Racing League competitor and current team-owner, with the Dreyer & Reinbold Racing team in the IRL's IndyCar Series. He was a color commentator for the IndyCar races on Versus. He won the 1992 Indy Lights championship and caught the eye of John Menard's Team Menard in 1996, running as team mate to Tony Stewart for two seasons succeeding the late Scott Brayton. He scored his first win in what was once the closest finish in series history when he beat ex-MasterCard Lola F1 driver Vincenzo Sospiri by 0.064 seconds at the New Hampshire International Speedway. He started his own team, Dreyer & Reinbold Racing, in 2000 and stunned the establishment with a win from 22nd in the grid the season opener at Walt Disney World Speedway. Mild to moderate success followed the next few seasons and he retired as a driver prior to the 2004 Indianapolis 500. He has continued as a team owner, with moderate success, failing to win any races, but his driver Buddy Rice finished 9th in points in 2007, the team's best points result since Buhl's 8th-place finish in 2000. 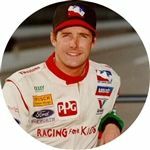 He is also a founder and key supporter of "Racing for Kids", a charitable foundation established to assist chronically ill children. Robbie makes a point of visiting sick children at hospitals on each stop of the circuit, bringing a bit of cheer to their lives in the process.